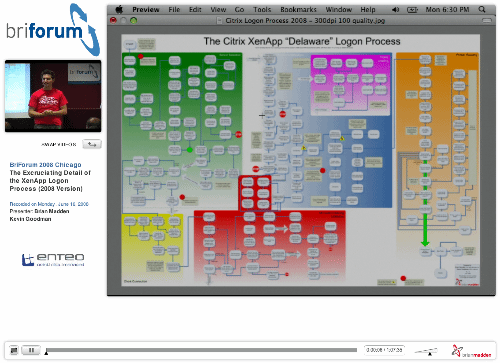 This week's BriForum video is always a popular session during the show: The Excruciating Detail of the XenApp Logon Process (2008 Version). Brian Madden and Kevin Goodman have been doing this session since BriForum 2006 in Washington, D.C., evolving it over time as new servers and platforms have been released. This week's BriForum video is always a popular session during the show: The Excruciating Detail of the XenApp Logon Process (2008 Version). This session documents the steps of a logon to a Citrix XenApp Server from a successful credentials negotiation to the displaying of a published application. Each step of the process will be described in detail, including how virtual channels, user profiles, and user sessions are initialized. This is the session from past BriForums that produced the "Logon Chart," and we'll be releasing an updated chart to include XenApp 5 and Windows Server 2008. To view the video, click here or on the screen capture below, and the flow chart can be downloaded here (4MB JPG). Where can I find this flowchart? Yeah, I'd like to get the flow chart. I believe Brian tells you how to get it online during the video. It isn't cheap, but that money is going to the printer & shipper, not Brian. grabbed the right one since there's been several iterations of it. Whooo Hoooo!!! Thanks for making this available. Great document! do you know if I can still download the old workflow for PS4 and the one for PS 4.5 ?? do you have a new version of this chart? It would be great to have a 6.0 and 6.5 version. Definitely excruciating, but great detail. Love to see the updated version for XenApp 6.5.
can any body help me in knowing? what are benefits and future in Citrix XenAPPs 6.5 platinum, advance and enterprise? I hope some one will come forward to help ASAP.